Need more information about booking Home 298296 ? Nearly all the guest reviews on TripAdvisor comment on the great location and we have many return guests. Such is the location that Car Hire is of no benefit. Casa Innismore is situated in the private and very secure gated development of Las Terracitas which is just one minute from the Spar Supermarket, Bars and Restaurants. Two minutes from the old harbour and only a ten minute stroll down to Playa Flamingo Beach. The Villa consists of a comfortable living and dining area which is air conditioned. There is Sky TV ( limited channels available in Lanzarote) and a music system with Bluetooth which enables you to play music from your phone. There is also a DVD player with a selection of films available. Wi-Fi is provided free of charge. There is a fully equipped kitchen with all the necessary appliances including oven/hob, fridge/freezer, dishwasher, washing machine, microwave and Nespresso coffee machine. Master Bedroom with double bed and en suite bathroom with walk in shower. 3rd Bedroom with single bed. Villa accommodates 4 guests but 3rd bedroom offers option to sleeping arrangements. 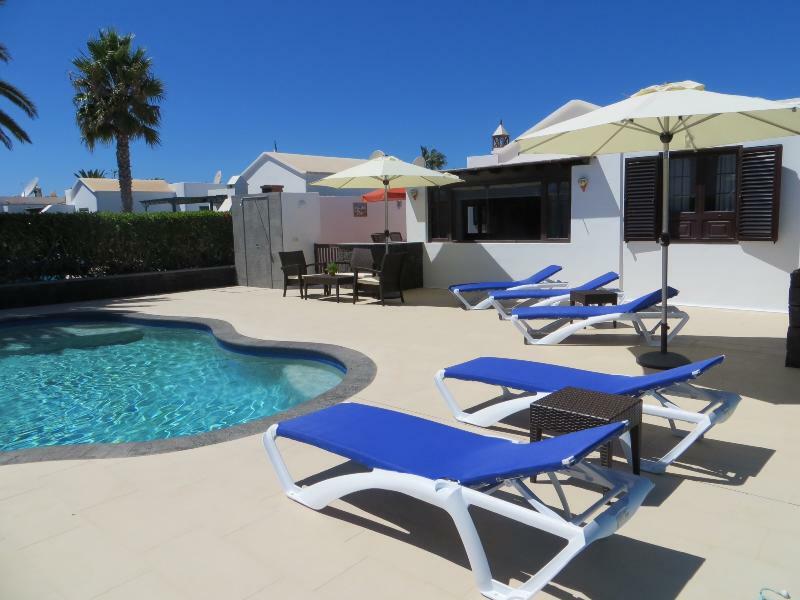 Outside there is a very private alfresco area complete with Canarian Style Barbeque which leads to the swimming pool area which is gated and very safe for small children. The Swimming Pool is Heated to about 28 degrees ( October/May ). There is also a roll out thermal pool cover for guests to use which maintains the temperature overnight. The pool is cleaned and checked twice a week by our pool technician. The pool also has a lovely waterfall and the pool area is nicely lit by night with LED lighting. For your peace of mind we have a local Villa Management Company who are available if needed during your stay. It is a legal requirement to provide your details when staying in short term accommodation in Lanzarote. If you have stayed in hotels in the past, you may recall that you had to leave your passport with reception while they registered you details with the Guardia Civil. This process now has to take place for guests aged 16 and over staying in private holiday lets. Response from the owner Hi Joanne, Delighted you enjoyed your stay at Casa Innismore and hope to see you back again in the future. Sean. You can get in touch with Sean (the owner) through the contact form on this page. Send Sean (the owner) an email through the contact form on this page. Alternatively, if there’s a phone number on this page, you can call them. How do I contact Sean (the owner)? You'll need to send Sean (the owner) an enquiry to book - the owner will let you know how to pay. If they accept online booking they'll send you a quote and info on how to pay. If you pay through our website you’ll be covered by Payment Protection. Or you can send Sean (the owner) an enquiry through the contact form to request a quote. Sean (the owner) will email you the total cost for your dates and how to pay. Send Sean (the owner) an enquiry through the contact form requesting a quote for your holiday dates. Sean (the owner) will email you the total cost for your dates and how to pay. Sean (the owner) of this property is responsible for taking and refunding your damage deposit. The damage deposit terms should be agreed before booking and outlined in the booking contract, if Sean (the owner) supplies one. Please refer to these details or contact Sean (the owner) directly if you have any questions. You'll need to contact Sean (the owner) to cancel. They should have provided their contact details when you made your booking - otherwise, email them through the contact form. You'll need to contact Sean (the owner) to edit your booking. They should have provided their contact details when you made your booking - otherwise, email them through the contact form.